Viagra use has long been linked to vision and hearing problems, as well as possible heart complications. But its active ingredient, sildenafil, more recently has been linked to an increased risk for melanoma, the most dangerous skin cancer. In 2014, a study published in JAMA Internal Medicine found that sildenafil, more commonly known by its brand name Viagra, may increase a man’s likelihood of developing melanoma by as much as 84 percent, for those who reported using Viagra in the three months prior to the study’s start. The study included a total of nearly 26,000 male participants who were followed by researchers for 10 years. At its conclusion, it was found that men who reported using Viagra some time before the onset of the study were 92 percent more likely to be diagnosed with melanoma than those men who reported having never used the drug. But study co-author Wen-Qing Li said more research is needed prior to concluding that the use of Viagra causes melanoma. Li and co-author Dr. Abrar Qureshi said the study’s results merely point to a correlation, or link, between the two. In an editorial accompanying the study, Dr. June Robinson of Northwestern University’s Feinberg School of Medicine said doctors treating older men taking Viagra should also be checking them for signs of skin cancer. Men make up about 67 percent of the melanoma deaths in the U.S. Skin cancer is the most common type of cancer in the U.S., consisting of three subgroups of the cancer most routinely affecting a person’s head, face, neck, hands and arms. Basal cell cancer and squamous cell cancer are the most common forms of skin cancer, with melanoma being less common but the most serious of the three. Melanoma is the leading cause of death from skin disease. It is caused by changes in skin cells called melanocytes. These are the cells responsible for a person’s skin color pigment called melanin. Melanin is the substance that gives us the color of our skin and hair. While melanoma only accounts for about 1 percent of skin cancers diagnosed in the United States, it causes the most deaths from skin cancer. The American Cancer Society (ACS) estimated that about 87,110 new cases of melanoma will be diagnosed in 2017, with approximately 9,730 of those cases expected to result in death. The ACS also found that the rates of melanoma have significantly risen over the last three decades, with the American Academy of Dermatology (AAD) estimating that 1 in 5 Americans will develop skin cancer during their lifetime. The AAD stated that melanoma rates in the U.S. have doubled from 1982 to 2011, and currently more than 1 million Americans are living with melanoma. The average annual cost of treating melanoma in the U.S. is estimated to be around $3.3 billion. The first sign of melanoma is often a change in the size, shape, color or feel of a mole. 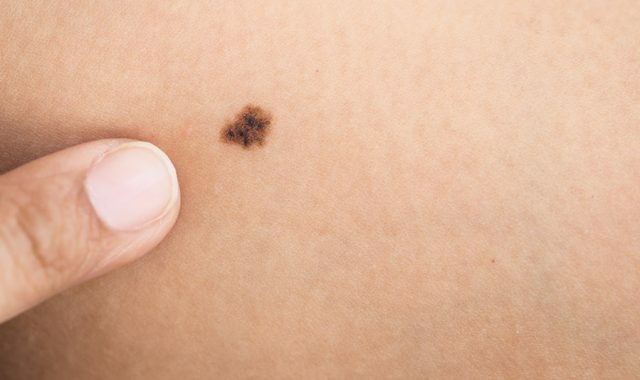 It can also appear as a new mole, and may be black, abnormal or “ugly looking.” Most melanomas have a black or black-blue area. Meaning if the mole were to be divided in half, are the two halves different in size and shape? Does the mole have irregular edges or borders? Is the mole more than one color? Has there been a change in size (most often growing larger)? Changes in the mole over a period of weeks or months; is the mole itchy, oozing or bleeding, or is it ulcerated (a hole that forms in the skin)? The earlier melanoma is discovered, the more successfully it can be treated. Surgery is needed to effectively treat melanoma. According to the American Society of Clinical Oncology (ASCO), most people with melanoma are cured after their initial surgery. During surgery, the cancer itself, as well as some of the surrounding area, will be removed depending on how deep the melanoma has grown. In cases where the skin cancer has spread to nearby lymph nodes (small bean-shaped glands present throughout the body that help fight off infection), the lymph nodes will be removed as well. If the cancer has spread to other organs, melanoma is typically considered incurable as it becomes much more difficult to treat. At this point, a person’s 5-year survival rate (or the percentage of people still living five years after the cancer is found) drops from about 98 percent to about 18 percent. Medicine used to kill cancer cells. These are drugs generally used along with chemotherapy and surgery to further assist the immune system in fighting the cancer. These treatments are used in an effort to relieve pain or discomfort. Even once cancer has been spread to other areas of the body, surgery can be useful in removing the cancer and can help to prevent further growth of the cancer. Even after recovery, melanoma can return. A patient’s risk of melanoma increases once they have already had the cancer. It is important for an individual at an increased risk of acquiring the disease to undergo regular checks for skin cancer, as melanoma can spread to other areas of the body very quickly. Side effects of melanoma treatments may include pain, nausea and fatigue. 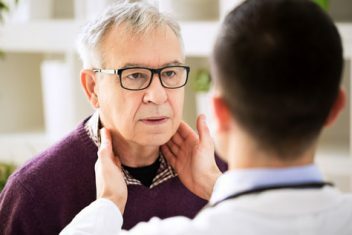 In 2000, 25,848 male participants were questioned in a follow-up study at the Harvard School of Public Health about the use of sildenafil (Viagra) and a patient’s risk for developing melanoma. The results found 142 cases of melanoma out of 3,752 total occurrences of skin cancer. Self-reported questionnaires included inquiries as to the men’s sexual health, use of Viagra, and history of sun exposure and genetic skin cancer risk, even noting the significance of hair and eye color as well as their history of moles. The authors of the study concluded that erectile dysfunction (ED) itself was not a factor associated with a higher risk of melanoma. Additionally, the study did not reveal any link between sildenafil use and other skin cancers, including squamous cell carcinoma (SCC) and basal cell carcinoma (BCC). Wen-Qing Li and study co-author Dr. Abrar Qureshi, pointed to one theory for the correlation between the use of the erectile dysfunction (ED) drug Viagra (sildenafil) and the significant increased likelihood of the melanoma development. Viagra helps patients get an erection by suppressing the phosphodiesterase (PDE) 5A enzyme, a process that mimics the activation of a mutation commonly seen in melanoma. The PDE5A enzyme is regulated by what is known as a BRAF gene, which belongs to a class of genes known as oncogenes. The BRAF gene provides instructions for making a protein, a part of a signaling pathway known as the RAS/MAPK pathway, that helps send chemical signals from outside the body’s cells to the nuclei. As a whole, the RAS/MAPK pathway is responsible for regulating the growth and division of cells, the process by which they mature and carry out specific functions, their movement, and their self-destruction. The chemical signaling that occurs across this pathway is essential for normal development prior to birth, according to the National Institutes of Health (NIH). When BRAF genes, or oncogenes, become mutated, they have the potential to cause normal cells to become cancerous. PDE5A is lowered, or inhibited, by activating these so-called BRAF genes with the use of sildenafil (Viagra), thereby increasing the invasiveness of melanoma cells and presumably resulting in an increased risk of melanoma development in Viagra users.